Sauteed mushrooms recipe makes up a delicious simple breakfast. Sauteed mushrooms recipe makes a very quick and healthy breakfast. 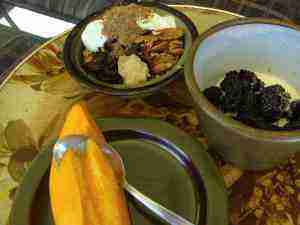 Breakfast, in most families, is eaten on the run; and often pretty junky too. But over the weekend, there's nothing like leisurely meals. That doesn't mean it has to be fattening, either; just make sure the high glycemic index carbohydrates are kept to a minimum. That means no sugar pops or donuts; and a maximum of one slice of toast; whole wheat, of course, or our low GI loaf. White bread rolls should be kept for high and holy days only; they turn straight to glucose in the blood stream which means they get deposited just where you don't want them. Some aforethought of course is necessary. Get to the supermarket and make sure you have a couple punnets of mushrooms, a pocket of oranges, a bag of super ripe tomatoes and perhaps another fruit too; pawpaw is one of my favourites but an avocado is super healthy. A box of eggs and your usual herbs and spices, butter and olive oil, of course, will be needed for the saute. You do know, I hope, that butter is back. It should never have been sent packing. There's no place for margarine in the health conscious family. Sauteed mushrooms recipe makes up a delicious simple egg substitute breakfast. A favourite breakfast drink here in Holland is "karne melk" (soured milk). Recently, in Holland, I've been enjoying a weak black tea with a slither of ginger and a slice of lemon thrown into the pot. Personally I don't like the taste of tea bags, so it's loose tea. Okay, so it takes an extra couple minutes to cut one orange per person, squeeze it, and add some water. I use the whole orange (minus the skin of course) as many of the best nutrients are found in the pulp. She who must be obeyed likes the pure juice so you'll see I do use a strainer above, but that pulp goes into my glass, not the waste. Perhaps a couple tablespoons oats muesli ... and another fruit? Some added seeds and freshly cracked walnuts or pecans really make a muesli. Add some raw, lightly filtered honey, if you can find it. Surprisingly, honey doesn't have a high glycemic index. 3. 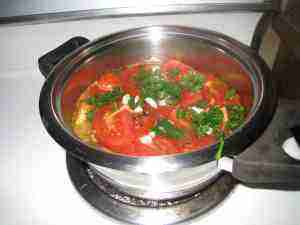 Tomato relish with your sauteed mushroom recipe. Slice up an onion and a clove or two of garlic, and fry slowly over a low heat with a little butter. Chuck in a couple of tomatoes, and slice in a few slithers of lemon rind. Cover and cook over low heat once it's boiling merrily. Delic. Add a little water to stop it from burning. Fresh Tomato recipes .. easy tomato relish recipe. 4. Hot Fried Potato with your sauteed mushroom recipe. Partially microwave one large potato per person, slice it thinly, and drop it into a frying pan with a little hot olive oil, or better still for cooking coconut butter. Know why olive oil is the best oil in the world? Just what are all those olive oil benefits? Should one pay the extra? Potatoes, sadly, do have a very high glycemic index and are rapidly stored as fat in the body. But occasionally, provided there is added fat and protein in the meal, you can enjoy a potato; fried in butter or coconut oil and with an egg in the meal, you can relax and enjoy, unless you really have a weight problem; then avoid potatoes. Whilst fried potatoes certainly shouldn't be on the menu if you have a weight problem, well, not more than once a month anyway, but the oil does lower the Glycemic Index of potato, the rate at which it's changed to blood glucose. Am I repeating myself? Yes, indeed, potatoes should be eaten with caution with those trying to get the pounds off. They are extremely fattening whatever way you enjoy them. And now of course the sauteed mushrooms recipe. Wash your mushrooms thoroughly (often they're grown in horse manure remember! ), and leave to drain properly. If you're in a rush, dry them with a paper towel. They must be dry or they'll stew instead of fry. Slice them in two if they are large. Remove the stalks. Drop a dollop of butter in a large heavy frying pan, and turn the gas onto high. When the mushrooms are really hot, dribble the upper side of the mushrooms with a few drops of olive oil, and flip the mushrooms. Quite soon they'll start to squeak and squeal (who says vegetables don't feel pain when you bite into them, or drop them into boiling oil?!! ), resist the temptation to add more butter or turn down the heat because you'll see little beads of oil breaking out of the mushrooms as they brown. Then they're ready. Just before they're done, not too soon, sprinkle with the sliced garlic and you other favourite herbs like parsley benefits and thyme, and turn the heat off. Flip them a few times. The bread machine is reputedly the most unused kitchen appliance. 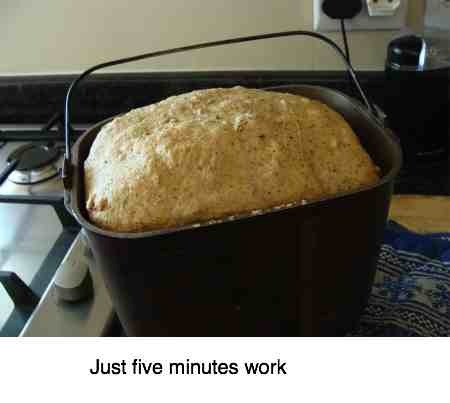 I really don't get it as it takes only five minutes, less actually to mix the ingredients; no chemicals, no preservatives, no heartburn, the very healthiest bread at half the price. By adding some protein, like a dollop of hummus, and extra fat you can turn it into low GI bread; isn't interesting that adding butter makes it less fattening? Those following the Banting diet, also known as the Paleo diet, will find that all bread is banned; they want you on an extremely low carbohydrate diet. It does have it's merits for the obese but if your BMI is less than say 28 you can enjoy a slice of low GI bread with your sauteed mushrooms recipe. If you cholesterol is in good shape, drop your fried or scrambled eggs into the other pan, and put the bread in the toaster. Actually, even the heart association has dropped its antipathy towards eggs; nevertheless, in moderation if your cholesterol is high. Interestingly free range eggs have triple the beneficial omega-3 and there are persistent reports that "proper" eggs have no undue influence on heart disease. 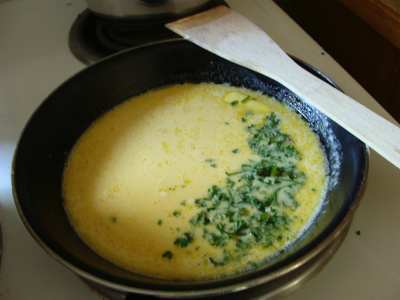 Add some parsley to your scrambled eggs. This is perfect for those who are banting. Whilst I too love bacon, with all the research coming out about processed meat, it's kept for high and holy days only; rather sauteed mushroom recipes. Come and get it! That's what I call a slap-up sauteed mushrooms recipe with all the trimmings. The kitchen wallah is going to need some help getting all the food onto the table. Relax and enjoy your Sunday morning slap-up breakfast with the family. After the rush and bustle of the week, the hurried shovelled-down breakfasts, you owe to yourself and your family to enjoy a treat. A healthy treat. If you're a Christian don't forget to give thanks, of course, or whatever deity you worship. As a great Jewish prophet said, "As for me and my family, we will serve the Lord." Amen and tuck in! Afterwards, many hands make light work when it comes to cleaning up the mess. 7. A bit of BEETHOVEN for the perfect Sunday morning breakfast. Yes, I regret, a lot of washing up after our slap-up-breakfast! By now the family will have appeared, those smells are irresistible, so get them to set the table on the patio (if it's summer!) 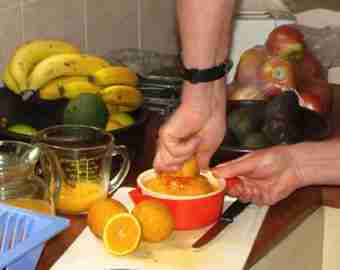 and to make a start on their freshly squeezed orange juice and sliced apples. Put on the Fifth, or your favourite Sunday morning music. "Did you ever see the customers in health-food stores? They are pale, skinny people who look half dead. In a steak house, you see robust, ruddy people. They're dying, of course, but they look terrific." - the inimitable Bill Cosby. So, are you pale and skinny and do you look half dead? Do you look terrific, but you're dying?!!! And aren't the pale and skinny people also dying? It's a valid point Cosby is bringing up. Can we look terrific and not be dying at a rate of knots? Personally, I'm also not a great health-food store person. 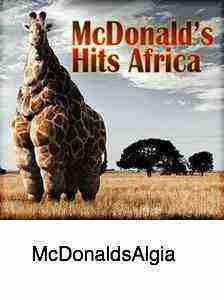 But then I'm also not a McDonald fan either! Slow-food made fast is the way forward. Take your vitamins and minerals because we live in a soil-denatured world. Eat your steak but try and get it straight from the prairies, not the feed-lot corn-fed, hormone-pumped variety. Do you think our friend above might be suffering from FOOT PAIN? It goes hand in hand with obesity. Chiropractic help is about better health naturally; that means more exercise and wonderful foods like our sauteed mushrooms recipe. There's strong research showing that fish soup at least once a week, a handful of nuts and seeds and more fruit and vegetables, amongst other simple dietary changes would reduce heart stroke diabetes by nearly 50%; that's massive. Perhaps because I was born and brought up in Africa where literally, no exaggeration, more than a million children die every year of starvation, I love to scour the Rotterdam market. Today, hunting for my Sauteed Mushrooms Recipe, I bought two punnets of mushrooms (500g each), both for € 1.00 (or $1.28 according to XE, they claim the world's favourite currency converter. Yes, it's true the mushrooms were on the turn. I knew that I had to use them today, or at the latest tomorrow, but they were absolutely fine for my SAUTEED MUSHROOMS RECIPE, even if they're slightly past their sell-by-date. Just how much good food do you throw away? According to the BBC, the average English family ditches about 30% of the food he buys. I doubt Holland, or America are much different. Perhaps eat and finish that mushroom soup, or save it for tomorrow instead of discarding, and make a contribution to Africa Enterprise's Street-Children project. The mushroom is one of those foods that should certainly be on the menu at least once a week; notwithstanding, they have been linked to gout in some sensitive people. In which case certainly don't have them more than once a week. But the mushroom, not just for their great taste, are richly endowed with fibre and many important minerals like the anti oxidant selenium. Don't take pills for your selenium; eat mushrooms! Healthy living tips contains oodles more similar stuff to this sauteed mushrooms recipe. It's all about getting your eight to ten coloured foods per day; that gives you a massive 35% lower all cause of death. Better eyesight means fewer car accidents, gamma tocopherol for a healthy prostate gland, hummus for less breast cancer, and so on. High cholesterol? TABBOULEH BULGAR WHEAT for lunch. Alas it's true and my own foot confirms it. 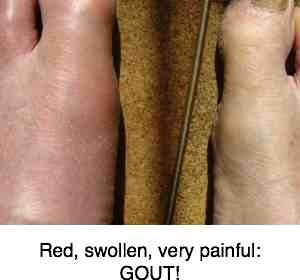 Twice, only after I turned sixty-five, never before, I've had painful attacks of gout, both times after a large mushroom meal. That's known as an anecdote, of no scientific value. But read up the research from the Mayo clinic and you'll see it's true. I still eat my sauteed mushroom recipe. In moderation. Pig out... and I pay for it. 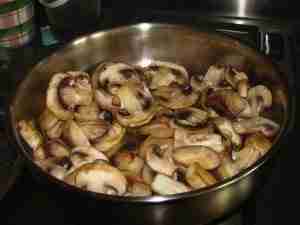 Sauteed Mushrooms Recipe could mean foot pain for some; watch for swelling and redness in the big toe.